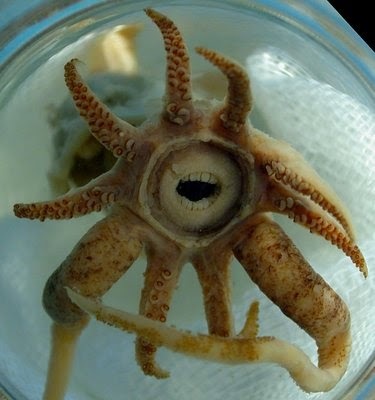 This weird, alien looking creature is scientifically known as Promachoteuthis sulcus. 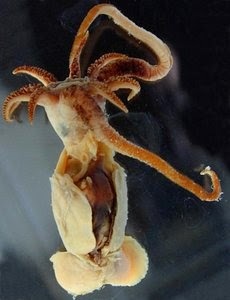 It is a rare, newly discovered deep-sea squid, best known for its seemingly human-like mouth. 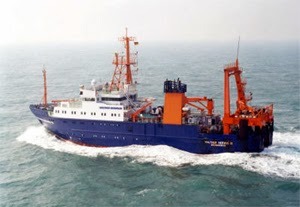 The species is only known by a single specimen that was caught in 2007, in the nets of the German research vessel "Walther Herwig", near the Tristan Da Cunha islands, at a depth of 1,750 to 2,000 m (5,740–6,560 ft). Don't be frightened by its appearance as it's a mere inch long! As for the human like-teeth.. Well, sometimes appearances are deceptive. As explained down below, the human-like dentures are something totally different! As aforementioned, the little knowledge we have for the species comes from a single, immature female, 25 mm (~1 inch) long specimen. For more extensive information and close up images of the various body accessories (head, arms, tentacles etc) please use the first link in the references section. About the human like "mouth"
Squids often have tough, razor-sharp beaks that they use to chop and chew their prey. P. Sulcus is no exception and does have a small beak, lurking deep inside the mouth, although it is not visible on the photos. 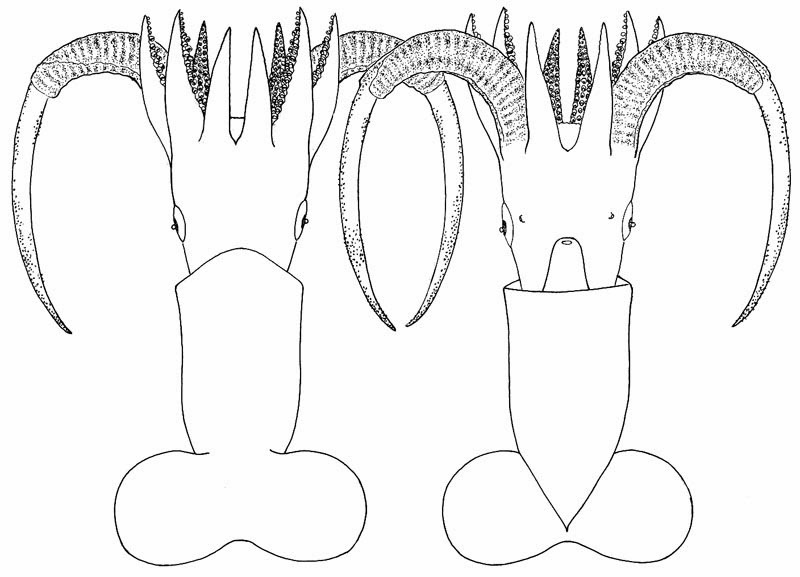 As for the creepy teeth, they are actually circular, folded lips, with only the upper and lower portions visible. 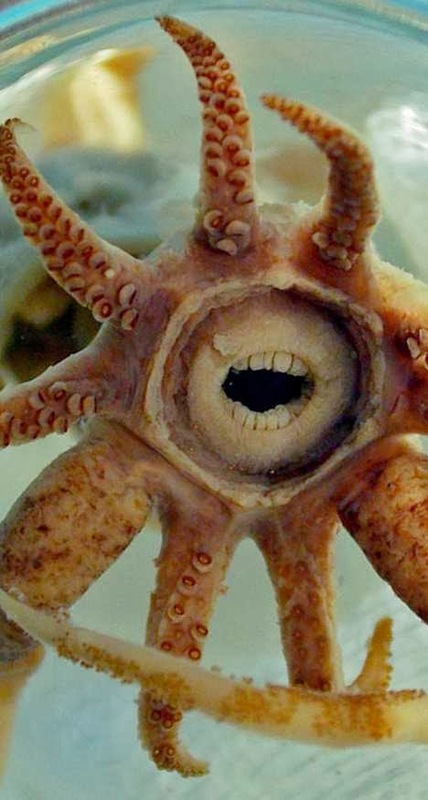 Despite its hideous appearance, Promachoteuthis sulcus poses no threat two humans, for two reasons. First, it is a deep sea squid. Seeing one in its natural habitat is highly unlikely. Secondly, the squid is very, very small. The 2007 specimen was barely an inch long, and scientists say they don't grow to be much bigger. 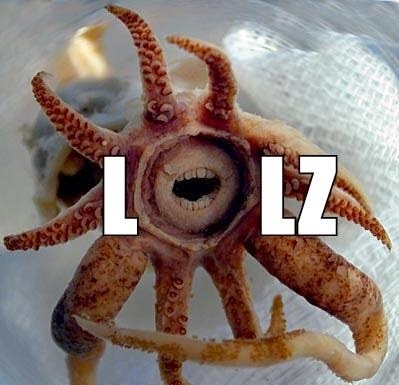 Bigfin squids: Think Promachoteuthis sulcus is scary? Think again! Bigfin squids look a lot like the aliens from the Independence day film! Not to mention that they can get to be at least 7 meters long!